#NHS Crisis - Not a political rant! 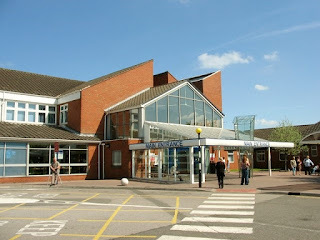 My local hospital - on a VERY quiet day! Let me make it clear. This is not a political rant. I do not have any affiliation to any political party. Whatever the current state of the NHS is down to more than one factor, lack of funds being only one of them. We are an increasingly ageing, and longer-living, population whose needs are not being catered for because of previously mentioned funding and lack of foresight of previous and subsequent governments. One phrase that irritates me beyond all else is ‘bed-blocking.’ It conjures up images of a cantankerous old man or woman sitting in a hospital bed with arms crossed and a mutinous look on their face, as if to say, ‘This is my bed and you’re not having it.’ Nothing could be further from the truth. Elderly people would love nothing better than to go home and sleep in their own beds. Unfortunately, this does not happen because there is no social care in place for them to be cared for, either in their own homes or in care homes. The crazy thing is that our local community hospital, which acts as in-between care before returning home, is threatened with closure! Why has the running of care homes been passed into private ownership? Surely this should be the responsibility of the State, again, whichever political party is in power. Many of the privately owned care homes are teetering on the point of bankruptcy. What happens if they go bust? Will the State take up the slack? I doubt it. And relatives, through having to work to pay their way and care for their own families, are not often in a position to help. We’re told that many people going to A&E departments do so because they can’t get an appointment at their local GP practice. Fortunately, I’ve never had trouble getting an emergency appointment at my local health centre though I’d have to wait up to a month to get a routine appointment. Now there is a suggestion that GP surgeries should open 7 days a week. How will this work when it’s an accepted fact many surgeries are short-staffed with fewer candidates are coming forward for GP training? What’s going to happen? In a world that is increasingly uncertain, who knows? I certainly don’t.